In the last month or so, there's been a big surge in live video broadcasting. Thanks to smartphone apps like Periscope, users can record live video streams and share them with their network. For example, a friend of mine recently used Periscope to livestream an iPhone video of her walking her dog. She shared a link to the live stream on Twitter, and a few of her followers clicked through and watched her walk her dog in real time. Kind of weird, but at the same time, kind of cool. So, why are we writing about live streaming dog-walking videos on a marketing blog? Because video broadcasting apps like Periscope (and its slightly older competitor, Meerkat) aren't just good for silly, just-for-fun clips like that one. It's a new tool that has a lot of potential uses for marketers like us. Twitter seemed to get the hint early on when they bought Periscope in February 2015, before it'd even launched. Download our full guide to using Periscope and other live video streaming apps here. Whereas social media sites like Instagram and Vine let users record short video clips and post them online afterward, Periscope takes a different approach, allowing users to post live video streams of what they're doing at that very moment. "It may sound crazy, but we wanted to build the closest thing to teleportation," said Periscope's founders. "While there are many ways to discover events and places, we realized there is no better way to experience a place right now than through live video." And that's just what they're doing. I've spent the last few weeks diving head-first into Periscope's app (available for iPhone and Android). 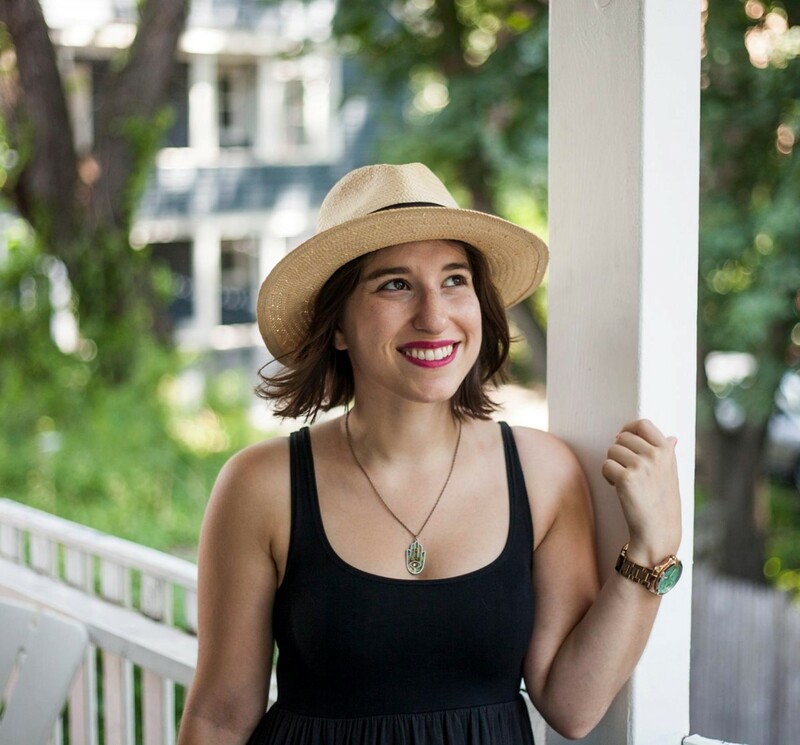 In this post, I'll share with you what I've learned through my experimentation. I hope these observations give you the desire and the confidence to experiment with live streaming yourself. It's a bit too early in the game for there to be benchmarks for which time windows will get you the most views, But, keep in mind that because Periscope is connected to Twitter, that's where you'll be promoting your broadcasts primarily -- so do some research on your Twitter audience to find out when they're most engaged with your posts. Even if some of your followers miss out, the app will save your videos to the app by default (although you can delete them manually if you want to), and they'll be available for viewing by your followers for 24 hours. You have the option of saving your videos to your phone's camera roll. 2) Spend time coming up with a compelling title. The title of your video is the only thing separating Periscope users scrolling through the "Featured" or "Recent" streams section of the app from clicking on your broadcast. All they'll see is the title of the video and your name. Because of this, it's vital that your title describe what your video is and why people should either tune in now or replay your stream later (up to 24 hours). Sometimes, the most effective title will tell people exactly what you're going doing in the video. For example, Elijah Wood posted a video with the title "Jellyfish" whilst visiting the aquarium -- which is exactly what the video showed; nothing more, nothing less. Another example? 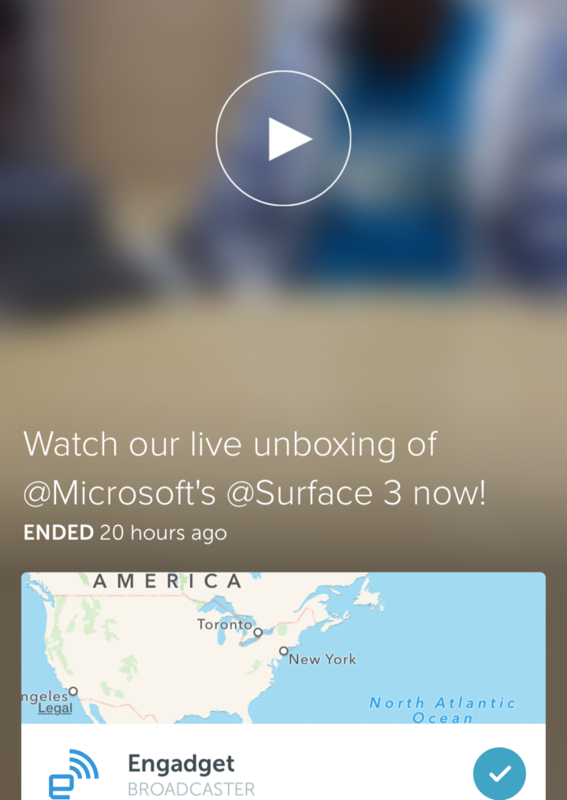 When Engadget broadcasted a video with the title, "Watch our live unboxing of @Microsoft's @Surface 3 now!" Can't argue with that. A title that lets users believe they're seeing exclusive footage can be super compelling. 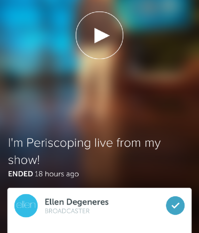 For example, Ellen Degeneres broadcasted a video titled, "I'm Periscoping live from my show!" for all the viewers at home. Another version of this could be "A Back-Stage Look Into..." or something along those lines. Guy Kawasaki has gotten really into using Periscope to record talks and conferences. For example, he posted a video of "The Art of the Start lecture at Microsoft." This performed particularly well as it's both educational and experiential. 3) Make your broadcast easy to find. When you use Periscope, you'll have the option to do a private broadcast, share the broadcast on Twitter, and share your location. To get the most views, I'd recommend sharing your broadcast on Twitter and turning on the location tagging option. This way, you'll reach a bigger audience -- and having your video on your Twitter feed gives it a longer tail strategy. There's no option to customize tweets yet. The broadcast will expire after 24 hours, and anyone who clicks on the link will be redirected to a page encouraging them to check out your broadcasts and download the app. Location tagging was a major privacy concern for many people when Periscope started because it pinpointed the specific location you posted from. Thankfully, they've updated the app since then so that your location is recorded as a large geographic region rather than a specific location. So you should feel free to share your location to provide context for your viewers. 4) Respond to comments live. One of the coolest features on Periscope is that people who are watching your stream in real time can comment and "like" the broadcast (which show up as hearts, like on Instagram). Other viewers are able to see these comments and the number of hearts your video has. Acknowledge or even respond to these comments out loud on the live broadcast to encourage engagement and make the experience feel like more of a two-way conversation. The number of hearts you get helps you get your username ranked in Periscope's app under "Popular People to Follow." There's also a "Most Loved" section in the app that lists users with the most total hearts from all their broadcasts. 5) Experiment with use cases. Since Periscope is still so new, there aren't solidly defined ways to use it, especially for brands. This is a unique opportunity for you to experiment with different ways of using it and what type of content your audience likes most. Periscope lets you analyze a few key stats you'll want to keep track of while you're figuring out what works. Once your video ends, the app lets you see how many live viewers you had, how many viewers replayed your video, and how many hearts your video received (this number updates automatically as users continue "liking" your video from the time it ends until it expires). I hope you've found my initial observations and tips helpful. I'd love to hear how you're using Periscope, whether for personal or professional use. Please share stories and advice in the comments below!